Roncesvalles Wins CBC Song Quest! We’re delighted to announce that Roncesvalles surged ahead of all competitors in the Ontario section of CBC’s Song Quest to win. Thanks to everyone who voted, and thanks especially to Roncy businesses who got the word out! We’re looking forward to hearing what Jully Black will create about our great street. This entry was posted in CURRENT, Front Page, In The Press on October 2, 2010 by Keith Denning, Coordinator, RVBIA. We were very pleased to see that twenty-five of our businesses were lauded in an excellent and glowing online article in Toronto Life. Thanks for today’s great online feature on Roncesvalles Village (The Roncesvalles Guide, April 22, 2010). We appreciate your recognition of the wonderful businesses in our neighbourhood! As I’m sure you’re aware, Roncesvalles Avenue is in the midst of a long-planned rejuvenation of our streetscape. We are excited by the expanded sidewalks and other improvements that will soon be built, and the many healthy trees that will grace our street in 2011, planted at grade along our sidewalks, which will create a beautiful tree canopy that will last for generations. With the worst stage of construction behind us, I wanted to assure you that Roncesvalles Village is a welcoming place and that visitors will have a great time in our neighbourhood. 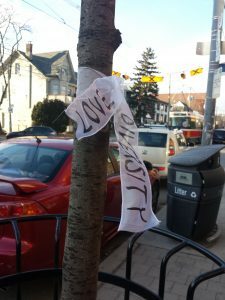 I invite you and all your readers to visit Roncesvalles Village and take advantage of the three hours of free on-street parking in effect until late 2010! With three hours to linger on Roncesvalles, you could take the opportunity to visit those businesses that were featured in your article as well as the many other terrific cafés, restaurants and shops that make Roncesvalles Village a place I’m very happy and proud to call my home. This entry was posted in Community News, CURRENT, In The Press on April 23, 2010 by Keith Denning, Coordinator, RVBIA. We’ve sort of forgotten about the Poles. And I don’t mean the ones at Filmore’s and the Brass Rail. I mean the 300,000 of Polish descent who inhabit the GTA, no fuss, no muss. Other immigrants grab all the attention. Tamils, Tibetans, Somalis, Filipinos, Russians, Iranians, Serbs, Indians, Pakistanis. You can’t miss ’em. The Irish raise the roof on St. Patrick’s Day. The Italians mob College St. when the Azzurri win. The Jamaicans rule during Caribana. Meanwhile, the Poles quietly and diligently go about their business on Roncesvalles Ave. or in Mississauga. This entry was posted in ARCHIVE, Front Page, In The Press on December 11, 2009 by Keith Denning, Coordinator, RVBIA. Congratulations to Imelda (123 Roncesvalles) and the Revue Cinema (400 Roncesvalles), both winners in NOW Magazine’s recent “Best of Toronto” issue. Imelda was awarded the Critic’s Pick of “Best Shoe Store In Toronto”, while the Revue was voted by readers “Best Repertory Cinema in Toronto” for the second year running. Imelda and the Revue join the many other award-winning businesses in our great neighbourhood. This entry was posted in CURRENT, Front Page, In The Press, Kudos!, Members News on November 8, 2009 by Keith Denning, Coordinator, RVBIA.